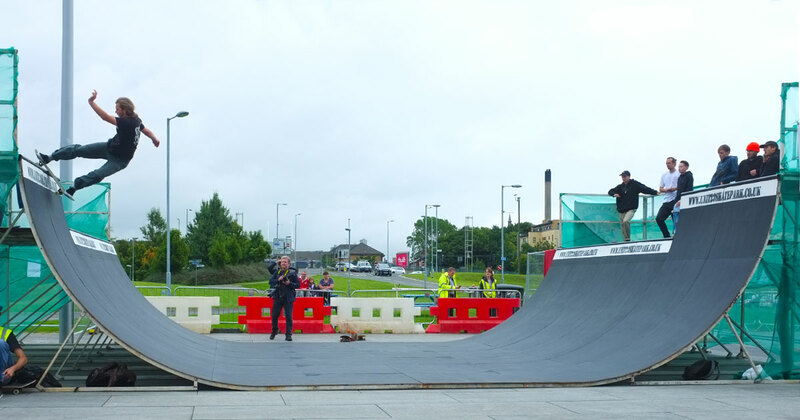 Over the weekend of the 8th and 9th of September Glasgow’s one and only Clan Skates organised a celebration of their 30 years in business by working with the nice people at the Glasgow transport museum to host the Scottish Mini Ramp champs and a massive game of skate. Skateboard Scotland were on hand to help with the judging and running of the events over the weekend. Most of the competitions happened on the Saturday as we did not have a cover over the ramp this time around. The ramp was more of a midi than a Mini and was provided by Unit23 skatepark guys. It was not the biggest turn out as the weather did look suspect and the UK Mini ramp champs were going on down south but it was certainly fun and the skating went off. The Game of skate went on during the course of day and was fun to watch as the level of ability and consistency from the Glasgow heads was as high as ever. We ended up with Shuggy versus Andy White and Tom Shimmin versus in the semi-finals. Winton had come through all the way from Perth to skate with the Glasgow crew. Shuggy’s quirky tricks meant that his heat was close but in the end Andy White triumphed. Winton’s ability to make flip tricks look easy and pull out some weird ones lead to him beating Tom and getting into the final with Andy. The final went on for ages with both riders making trick after trick. In the end Winton pipped Andy at the post and won himself some lovely cash money. This was the 4th annual mini ramp champs run by Skateboard Scotland. The format was Jam style heats with and opening runs for each rider followed by an 8 man final. This meant everyone knew who everyone was and the Jam format meant that the skating went off. Bailie was keen to check what the format was to ensure that he did not peak too early! I don’t think that he should have worried as he smashed as usual and earned himself first place. Some of Bailie’s lip tricks need to be seen to be believed. Grant Johnston was going at it hard and giving everything that he has whilst taking some gnarly slams and riding out of some tricks in a very Adam Paris magic carpet ride style. IE there is no way that he should have been able to hold onto some of them. But he did, and that got him into second place. Aaron came in a solid third by skating consistently and going big on the extension. He also treated the crowd to his signature frontside flip which went down well. Other tricks of note were Ross Matthew’s blunts on the extension and Marty’s backside tailslide that was worth the wait. Looking forward to having the same fun next year!